A CONSERVATIVE MP has said Prime Minister Theresa May hasn’t got a “cat in hell’s chance” of getting her Brexit deal through parliament, and warned that she could face a no confidence vote in her as early as Monday. 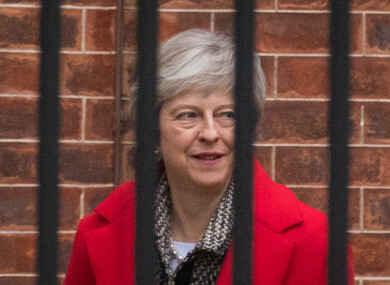 The Prime Minister has hit back at her rivals, however, telling the plotters planning to overthrow her that their alternative Brexit plans would not make all the problems disappear. Mid-Bedfordshire MP Nadine Dorries told Sky News she wouldn’t be surprised if there already had been 48 letters sent in to trigger the no-confidence vote in May, and said that “most MPs” will vote against the Prime Minister. The embattled occupant of 10 Downing Street managed to secure Cabinet approval for the Brexit deal following a lengthy meeting on Wednesday, but many of its provisions have proven unpalatable to those who supported Brexit and resignations from the Cabinet swiftly followed. May insisted there was no better option on the table and any alternative plans would still not conjure up a solution to keeping open the border with the Irish Republic. “People say ‘If you could only just do something slightly different, have a Norway model or a Canada model, this backstop issue would go away’. It would not. That issue is still going to be there,” she told the Daily Mail newspaper. “It’s not everybody’s ideal deal. You were never going to get that. Dorries is one of those vehemently opposed to the deal, and said that it made the UK “slaves” to the EU. “I would call us a vassal state, an empty state, I’d call it serfdom, it’s appalling,” she said. It’s actually beyond belief Number 10 – although they’re spinning like mad – think they can sell this to the country. They can’t, people can see right through it. Speaking this afternoon from the Fine Gael Ard Fheis, Taoiseach Leo Varadkar said he “didn’t see much scope for changes” to this agreement reached between the UK and EU, given the tight timelines. He said he would not deal in “hypotheticals” when put to him that the deal might not get passed by the UK parliament. Varadkar said it is now time to ratify the deal that has taken two years to negotiate. Once you start making amendments the whole thing begins to unravel, he said. Finance Minister Paschal Donohoe said that Ireland will be ready to respond to the different challenges and risks that could be created in the scenario of a hard Brexit. “If we find ourselves in a position where the draft protocol is not agreed by the United Kingdom and the European Union, we clearly face a far higher risk than we had before. “Ireland will be ready to respond to that, we will do all that can be done,” he added. Email “May takes potshot at rivals as Brexiteer tells her not a 'cat in hell's chance' of getting Brexit deal through”. Feedback on “May takes potshot at rivals as Brexiteer tells her not a 'cat in hell's chance' of getting Brexit deal through”.